I was out to dinner with a friend and had just ordered my food when I got a text from Abby on July 27th. We chatted a bit about what was going on and she said she was sure I didn't need to leave just yet but I figured I'd go ahead and eat and make my way there right after that anyways. My food got to the table and I took maybe 1 or 2 bites before the next text came in. Things were moving way faster then we thought and I needed to go right then and there. My friend ran over and grabbed the waitress to get a box for me and then I was out the door and in my car. I had a two hour drive to Mercy Birthing Center and was just hoping the whole time that I would make it in time with how quickly things had started to go. I texted Abby when I was about 45min out to let her know and didn't hear anything back so I knew she was probably either 1. in the thick of it now or baby was in her arms, I was just hoping it was the first one! I finally pulled in to the parking garage after what seemed like FOREVER, grabbed my bag and started running! As soon as I hit the elevator I got a text saying "This is Abbys mom, she's an 8 now" and I texted back with "I'm here, walking down the hall now!" as I ran down the hallway. Her husband met me at the front of the birthing center and we ran in quickly. Abby was already in the tub at this point and I was right, she was in the thick of it and baby was going to be here very soon. It was pretty funny because even in the middle of it all she kind of let out a big sigh of relief and smile when I walked in. Her nurses even said to her "oh now we get a little smile out of you!". Trust me, her and I both were glad I had made it there in time!! 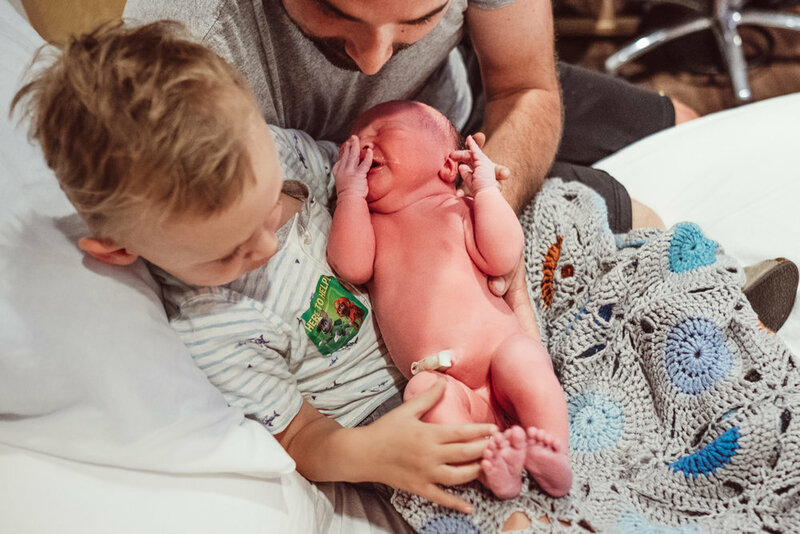 Just 45min after I got there, at 12:10am on July 28th, we were all welcoming sweet baby Reagan into the world and big brother Oliver was coming in to meet his new little sister. Abby and Caleb did an amazing job together and brought the most beautiful little chunky babe earth side. Both of their moms were also present during labor and delivery and that was so special to watch, they were such amazing support. 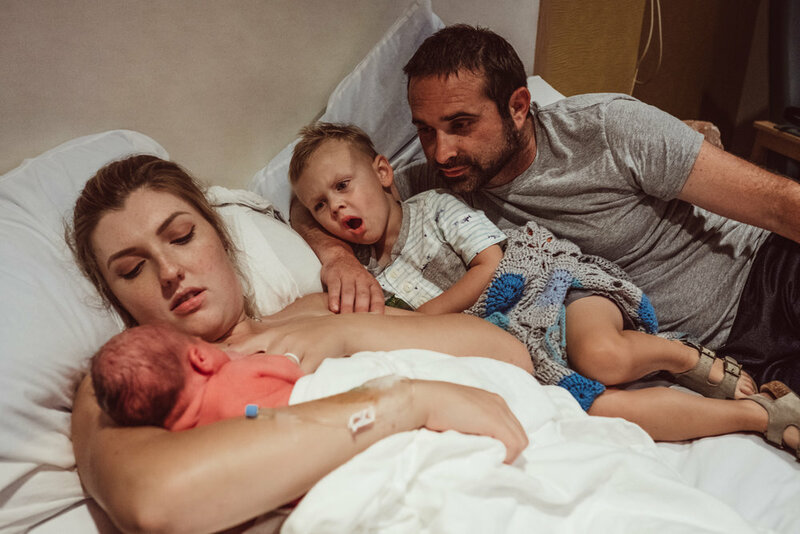 Take a look below to see some of their birth story photos and scroll to the end to watch their birth film! I also wanted to give a huge shout out to all the staff at Mercy Birthing Center, St. Louis for being amazing. They were all so welcoming of me as well as amazing support for mom and always listened to what she wanted and needed. You can even see in one of the images below where one of the nurses laid out the placenta for me and even made a heart shape with the umbilical cord! Such a great environment to bring your new babe earth side. Watch a Mercy Birth Center Birth Film below. Are you ready to contact your Missouri Birth Photographer? Dannielle is Missouri’s premier Birth and Fresh 48 photographer. Dannielle is Missouri’s premiere Birth and Fresh 48 photographer.